A thyristor bridge is a technique commonly used to control the speed of a DC motor by varying the DC voltage. Examples of how a DC rectifier bridge operates are given on the next few pages. Voltage values given in these examples are used for explanation only. The actual values for a given load, speed, and motor vary. It is important to note that the voltage applied to a DC motor be no greater than the rated nameplate. Armature windings are commonly wound for 500 VDC. The control logic in the drive must be adjusted to limit available DC voltage to 0 – 500 VDC. Likewise, the shunt field must be limited to the motor’s nameplate value. A DC drive supplies voltage to the motor to operate at a desired speed. The motor draws current from this power source in proportion to the torque (load) applied to the motor shaft. In this example an unloaded motor connected to a DC drive is being operated at 100% speed. The amount of armature current (Ia) and unloaded motor needs to operate is negligible. For the purpose of explanation a value of 0 amps is used. 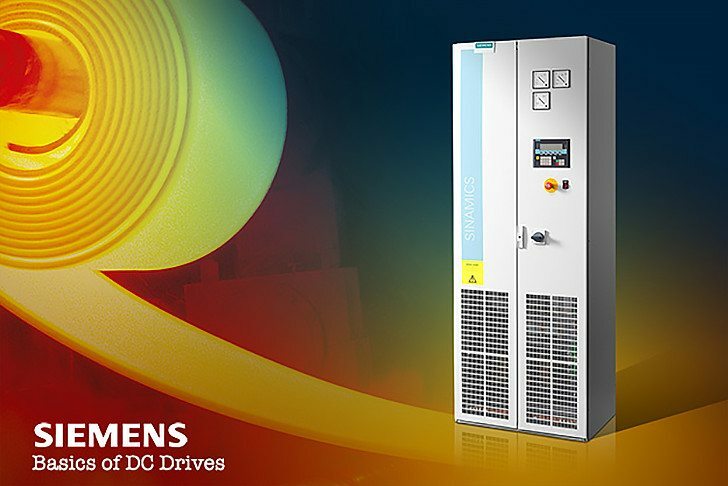 The DC drive will supply only the voltage required to operate the motor at 100% speed. We have already learned the amount of voltage is controlled by the gating angle (COSα) of the thyristors. In this example 450 VDC is sufficient. The motor accelerates until CEMF reaches a value of Va – IaRa. Remember that Va = IaRa + CEMF. In this example IaRa is 0, therefore CEMF will be approximately 450 VDC. A fully loaded motor requires 100% of rated armature current at 100% speed. Current flowing through the armature circuit will cause a voltage drop across the armature resistance (Ra). Full voltage (500 VDC) must be applied to a fully loaded motor to operate at 100% speed. To accomplish this, thyristors are gated earlier in the sine wave (36.37°). The DC drive will supply the voltage required to operate the motor at 100% speed. The motor accelerates until CEMF reaches a value of Va – IaRa. Remember that Va = IaRa + CEMF. In this example armature current (Ia) is 100% and Ra will drop some amount of voltage. If we assume that current and resistance is such that Ra drops 50 VDC, CEMF will be 450 VDC. I wish be a master in starting dc drive.